Hi, it’s Eva again, Fleewinter’s Thailand Travel Specialist. Whenever I see a long weekend coming up, I am trying to go somewhere new in Thailand so I can combine work with pleasure, relax at the beach and at the same time check out new hotels and experiences for my lovely clients. Last weekend I have taken my husband to Hua Hin and Pranburi, two lovely beach towns just 2-3 hours south of Bangkok. After looking at different ways to get there, we decided that renting a car made the most sense to us since the cost for renting a car and the return transfer is basically the same, plus we wanted to check out places and hotels and didn’t want to rely on taxis and the public transport system (which admittedly outside of Bangkok isn’t that great anyway) to get there. Even though Hua Hin is only about 180 km from Bangkok, it still took us 3 hours as we had lots of traffic along the way. We had some appointments in Bangkok which took longer, so we left Bangkok only around 10am which wasn’t smart as every time we checked google maps, the traffic got worse. Note to self: Leave earlier in the morning next time! Day trip to Praya Nakhon, located at ‘Sam Roi Yot’, a national park. Visit to the Grand Dame of hotels, the colonial Centara Hotel with its beautiful gardens. In Pranburi it is possible to do a boat tour through the mangroves which looks fabulous (had this on my list but didn’t get around to do it either). So I will have to come back (poor me…) to do what I have missed out on. What really surprised me though was the prices of accommodation. In comparison to other Thai beach destinations, luxury boutique hotels are really affordable. One can rent a spacious room with its own pool in a 5* resort from £100 per night. Perched on the best part of Hua Hin’s beautiful beach, all of the 60 suites at the stylish Cape Nidhra come with their own private plunge pool. Cape Nidhra is a member of the prestigious Small Luxury Hotels of the World. We love it for its excellent service, elegant facilities and great location within walking distance from the nights markets. Overlooking the Gulf of Siam, the Rest Detail Hotel is a lovely boutique hotel, located at a beautiful part of Hua Hin’s beach, decorated in warm colours which immediately gives you a feeling of “arriving at home”. If you are looking for some quiet time, this may the best place for you: It is located a bit outside of town at a beautiful white sandy beach. Apparently this is where all Thai celebrities stay when they go on a holiday in Hua Hin (but I didn’t see any – must admit I probably wouldn’t recognize them either). The hotel offers a choice of luxurious rooms ranging from one to four bedrooms. Accommodations are spacious, offering a variety of options whether beachside, poolside or with their own private pool of Jacuzzi. I probably wouldn’t recommend the two entry-level categories as the Horizon Rooms with their own Jacuzzi on the balcony or even the Pool Village Rooms (with the pool literally at their doorstep together with double sun lounges built over the water) are a much better deal. The Putahracsa has the reputation to be the best hotel in town. It is a funky little hotel with a Cafe del Mar feel, blending a residential feel with chic urban living. The resort with its 67 rooms is set amidst beautiful lush green foliage and yet with direct access to a white sandy beach. The location is also excellent, not far away from the hustle and bustle yet in a quiet spot to be able to just relax. If you like it quiet, Pranburi, a further 45 minutes drive down south, might be the right beach place for you. The sleepy town with its beautiful sandy white beach is great if you want to relax. It also is Thailand’s best spot for kitesurfing. 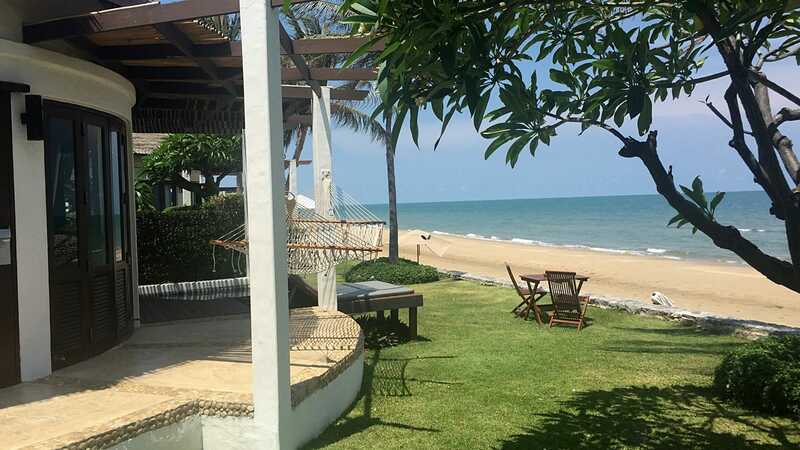 We stayed at the Aleenta Hua Hin for one night and I must say that it was just fabulous. I really enjoyed Pranburi as it was a lot less busy as Hua Hin and because the beach was just stunning. Due to its excellent winds for kitesurfing, a lot of kites appear in the afternoon which is amazing to watch. The resort features 25 unique residences, each located within steps of the beach. The main resort, located along the beachfront, features white-washed buildings with thatched roofs, amid swaying palms. The picturesque Resort Wing offers a variety of residences, suites and villas, steps away from the seashore. The Frangipani Wing accepts children of all ages, while the Aleenta Wing is adults only. Nearby, the whitewashed Chaba Villa, 2 to 4 Bedroom Villas are intimate hideaway with ocean views, another 4 Bedroom Villa shares a large living room and beautiful private garden. We especially enjoyed the a-la-carte breakfast and the complimentary canapes served for afternoon tea. Guests can simply step off their personal pier of the Studio Pier Pool Access Rooms to take a dip in Let’s Sea’s famed 120 m long lagoon, or choose the Moon Deck Duplex Suites which boast a private rooftop terrace to enjoy sun bathing or star gazing whilst savoring a favorite drop of wine. Even though I imagine getting out of bed and walking out of the balcony door to jump into the pool would be pretty cool, I’d still go for the Moon Deck Duplex Suite because of its amazing rooftop terrace from where one can gaze at the stars all night long. 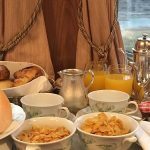 I especially like this resort because of its “eco-chic” policy: Food is as fresh and local as possible to reduce their carbon footprint and waste management throughout the property is carefully monitored. iPads are used for checking in and out of Let’s Sea, reducing photocopying and printing. The resort is also following strict standards for its suppliers preferring to partner with eco-friendly businesses. It is proud of its ISO14001 certification for which it is audited annually. This standard specifies an environmental management system that Let’s Sea adheres to for environmental and social responsibility. How amazing are these private rooftop terraces? 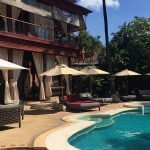 We stayed at the Anantara Hua Hin Resort & Spa for one night, which was fabulous as well; it just didn’t make it into my top 5 because I am not a resort type of girl, and this hotel has over 170 rooms. Also the location is not great as it is out of town and one has to take a shuttle bus to get there. That being said, my husband thought it was amazing and he told everyone how much he enjoyed lazing on the daybed on the balcony. We had so much food that I thought our stomachs were going to explode when the husband insisted that we had to order two Mango with Sticky Rice as dessert (it is a must when in Thailand) – a wise decision as the taste was simply incredible. This was our weekend in Hua Hin: Checking out hotels, lazing by the beach, enjoying Thai massages, taking a kite surfing lesson, shopping and, of course, eating our way through the menus. If you would like to visit Hua Hin and / or Pranburi, don’t hesitate to contact me at Fleewinter or at eva@fleewinter.com – I specialise in putting together private, tailor made holidays around Thailand and would be delighted to assist you with your travel plans as well.